When you're angry at something, make sure that the energy produced is not in vain. Do like me and follow this simple advice. Get a carton of fresh cream of the highest quality (me, I can only dream of it at night, but you, you should get some fresh cream from the mountain pastures, and perhaps even call Heidi, Peter, Grandpa, Fabio Volo [famous Italian radio personality, en], you decide...), or rather, since you're at it, just take two cartons, pour everything in a good ol' bowl, and start whipping. Whip, whip, with no fear, whip and beat with the mixer, cream starts swelling as usual, nothing new, keep going dauntless. Whip, whip, whip and beat, I promise that at some point the cream will get tired, deflate and become yellow of shame. And you hang on, whip, whip, whip and bash, and you already start feeling better. 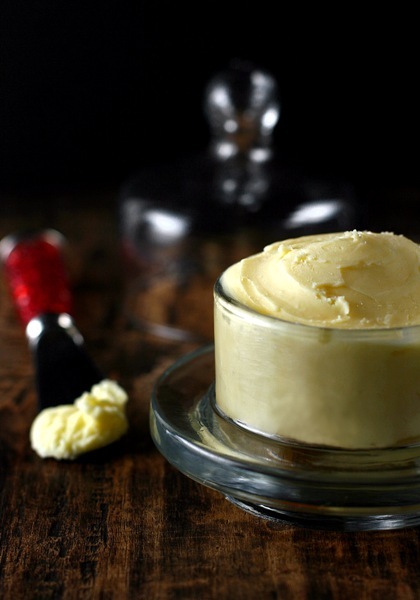 Whip and bash, and you'll see how your cream, all puffed up, in reality is just an easy lie. Soon, very soon, cream gives in to your stubbornness - but what am I saying? - it really breaks apart: on one hand the lumps of butter, and on the other hand an opaque liquid they say it's buttermilk. Ah-ha! Two birds with one stone, even better. You're almost there. At this point drain the liquid well, but you'd better remember to wash the butter under cold water several times until water comes out clear and limpid: this is the sign that all the stress, the anxieties and the darkness of the day have been washed out. Done! Now you can take your butter between your hands and make sense of it, shape it round, rectangular or cylindrical. Spread it on bread with a little honey. What are you saying? You're not angry anymore? That's perfectly okay, but before you go, remember this other trick: you can freeze the butter. SUPERCOOOOOOOOOL, isn't it?